Kandy is located at the center of Sri Lanka and is generally recognized as the island nation's cultural capital. It is on the UNESCO World Heritage List. Kandy is Sri Lanka's second largest city located in the mountainous center of the island. It is considered by some as the cultural capital of Sri Lanka, and was declared a world heritage site by UNESCO in 1988. A cooler climate and smaller size make it much more pleasant and accessible than Colombo. The city has a compact city center area surrounded by a beautiful tropical rain forest hill country on all sides with exotic animals such as monkeys running around in the wild. but it is also a major shopping destination where all kinds of goods imaginable can be purchased at surprisingly low prices. There are also numerous bakeries, offering delicious local treats all over the city center. Overall Kandy is a great place to experience Sri Lankan culture and cuisine surrounded by a beautiful natural environment. Buses serve almost all destinations. From Bandaranaike International Airport 1.2 km to the bus terminal. You can simply wait on the side of the road for the Kandy bus, but because the bus leaves the terminal when it's full, likely standing room only. From Colombo public buses start from the CBT or private ones from the bus terminal opposite the CBT (3 h, about LKR130). From Negombo bus terminal by direct public buses over CBT for LKR150 (June 2017). Bus number 245 comes straight past the airport. stand on the main road, on the other side of the fence.. bus will come from town, from the right.. 140rupees only. very frequent... . at 6am, just takes 3 hours. From Colombo, the bus number 1 goes between Colombo and Kandy. Also, the bus route number 17 goes from Panadura to Kandy, and you can catch that bus from the Nugegoda area for a faster travel time. Intercity air-conditioned bus (from Colombo) is the next best option to the hired taxis. If you are female and traveling alone it is best to either sit next to another female or try to sit as close to the conductor as possible (i.e. up front) to avoid any unnecessary surprise. Private A/C bus from the private bus stand in Pettah bus stand. A/C buses cost LKR 285 (Nov 2016). From Kandy, Colombo A/C buses depart from its own small bus stand. The bus stand is to your left as you walk towards the Kandy railway station from the Clock tower. If you do not find a bus, there are some long distance buses that go past Kandy (Colombo - Walasmulla, Colombo-Matale). The Colombo-Matale bus skips the Kandy town at Peradeniya. If you happen to get a Colombo-Matale bus, get off at Peradeniya, and it should be LKR 300-500 by Tuk Tuk to go to the Kandy center, or about LKR 15 by bus (take any bus that has the "Kandy" sign in it). They are just regular service buses without air-conditioning, or guaranteed seats. This can be, however, quite helpful if you arrive Colombo at the mid night and want to go to Kandy instead of spending the night in Kandy; just do not expect to sleep with the loud "music" in the bus and 70 other passengers looking for some space to sit. Train (from Colombo or Badula) - Intercity express train are hassle free and scenic. Reservation are needed for these trains, it can be done just before the departure depending on the period but is best done in advance especially if you are traveling on a weekend or holiday. There is a decent observation saloon (1st class) in this particular train. Normal trains are slower and 3rd/2nd class unreserved tends to be crowded. The trip from Colombo to Kandy costs LKR220 in second class, reservation however will set you back another LKR600, but apparently the first class is just LKR750 wherever you get off (Kandy, Badula, Ella, etc.). When you arrive, watch out for the tuk-tuk mafia at the railway station – better catch a tuk-tuk some distance from the railway station, or even better use Uber, PickMe or the like (again, some distance from the railway station tuk-tuk stand, as otherwise the tuk-tuk mafia there will threaten and chase your driver away). Taxi. If you're just arriving in Sri Lanka, heading for Kandy, you can hire a taxi from one of the stalls in the arrivals hall at Colombo airport for about LKR6,000. The journey takes about 3 hours. This saves the hassle of going into Colombo, and is a lot quicker. Hired mini-vans with a driver are available from Colombo through travel agencies and hotel concierges, e.g. . The road to Kandy is astonishingly chaotic and frightening even for seasoned travelers. Be prepared for a long slow slog in traffic, or, if your driver decides to make the journey at a more practical speed, a hair-raising adventure replete with passing around blind corners and games of chicken with the ubiquitous intercity buses. A day trip from Mt. Lavinia (Colombo) to Kandy, including seeing the sights in Kandy, costs around LKR10,000 [May 2011]. Air Taxi  (from Colombo) is the latest option to travel to Kandy. The De Havilland Twin Otter float planes operated by Sri Lankan Airlines leave Colombo at 9 am (currently from Kelani River) and touch down at Mahaweli River in Polgolla, Kandy at 9:30 am. The travel time between Colombo and Kandy is just 30 minutes. It costs LKR4,900 for a one-way fare and LKR9,800 for a return fare. Update May 12, 2016 - One way fare Colombo to Kandy is LKR 25,000. Cinnamon Air  operates daily scheduled flights that depart from Colombo (Bandaranaike International Airport) which reaches Polgolla Reservoir, Kandy in an hour and from Colombo City (Waters Edge) which reaches the destination in 30 minutes. One-way fare per person is listed as USD 153 (without tax). Walking is recommended as the center is not that large. It is a good way of seeing temples, shops, shopping area and other sights around the lake. Local busses can be used to visit nearby places (< 10 km). There are three bus stands, with only one of them with sign boards. All three bus stands accommodate both government-run buses and private ones. Private buses outnumber the government buses by quantity by far. The first and largest bus stand is called "Good shed", and is right next to the Railway station. All long distance buses depart from here, and now have signs indicating the destination. Even the locals have hard time finding which platform has which buses, and is quite difficult to explain in this article. Almost every bus in here are long distance buses, but you can hop on and get off at your destination. If you get on to a long-distance bus, try offer the seat to someone going all the way. Secondly, there is a bus station near the Clock tower. Bus routes 654, 621 and 620 (among others) start from here. Most notably, Digana is in bus route 654, Polgolla is in route 621. Matale is bus route 8, but note that if you want to visit Sigiriya, it is still a long way from Matale. Other bus routes include 603, 604, 606, 607, 609, and 613. Third, there is a bus station near the market and Torrington park. This is where you will find most of the buses to the interesting destinations. For the botanical garden, take any bus that goes through Peradeniya: Kandy - Panideniya 652, Kandy - Pilimathalawa 724 and 644, Kandy - Mahakanda 633. Buses cost from LKR9-20 for most of the nearby places. The conductors themselves will not speak good English, but Kandyans are quite helpful and will not hesitate to help you anytime. Note that these buses can be quite crowded in rush hours because most of the offices and schools are located in these roads. It is best to avoid 6AM-9AM, and 4PM-7PM if possible. Tuk Tuk taxis are cheap compared to European prices and a hassle-free way of seeing the greater city. They run virtually all night long. However, Kandy Tuk-Tuks have rather bad reputation. Especially, beware of the Tuk-Tuk mafia at the Kandy railway station – they are likely to rip you off (and they threaten Uber or PickMe drivers when they collect passengers near their stand). Normally one scooty will be LKR 2000per day. The Pinnewala Elephant Orphanage has about 70 semi-tame elephants roaming freely around this wonderful sanctuary. You can either hire a taxi or tuk-tuk to take you there directly or, if traveling on a budget (by bus), on the Kegalle Kandy road, 4-5 km from Kegalle at the Karandunpona junction take the road north heading towards Rambukkana for about 6 km - the bus price from Kandy to the junction is about LKR40, ask the bus driver to drop you off at the turn for Pinnewala. Alternatively, take a train to Rambukkana and walk from there. Follow the road through the village back in the direction the train has just come from and then turn right at the large sign for the Elephant Orphanage - it's about 2 km. Rambukkana is on the main line to Colombo and the journey is quite scenic, passing through jungle drenched mountains - definitely worth the trip especially if you have children. The best time to visit is the feeding time from 09:30-10:00AM and 01:30-02:00PM, and the bathing time from 10:00-10:30AM and 02:00-02:30PM when all the elephants are taken to the river close by. Entrance: LKR2,500 (September 2016). Alternatively but slightly different, the Millenium Elephant Foundation is right next to Pinnewala Elephant Orphanage. On the Kegalle Kandy road, 4-5 km from Kegalle at the Karandunpona junction take the road north by bus heading towards Rambukkana for about 3-4 km. The foundation is on the eastern side of the road. You can ride and wash elephants in the river. Entrance: LKR1,000. 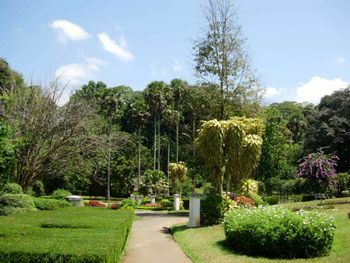 is the best botanical garden in Sri Lanka and one of the best in the region. It dates back to the ancient kings of the country although the British changed the look of it. The British are said to have used the gardens to grow trees that could not be grown at Kew gardens. The large banyan tree, the orchid house, the suspension bridge, and the bats are some of the main attractions. Foreigner entrance: LKR1,500 (Jan 2019). Drive there through the University of Peradeniya  the most scenic and the largest university in the country. There are plenty of buses going from Kandy to Peradeniya (Rs 15-20) which stop in front of Botanic Garden. New Ranweli Spice Garden phone="+94 77 1351931." web="" located in close proximity to Peradeniya Royal Botanical Garden (on the other side of the suspension bridge inside botanical gardens.) is a place to see and learn about Sri Lankan spices and herbs. It is a fun place to guess the spices. After seeing around the "garden" (which is actually just about 15 spice plants), spices can also be purchased as a souvenir, but there is no obligation to buy. Entrance free. Directions-It is much easier to visit New Ranweli Spice Garden for those who visit Peradeniya Botanical Garden. Simply take the SUSPENSION BRIDGE inside the botanical garden and make it to the other side of the river (ignore the STOP sign), take the road (Gannoruwa Muruthalawa RD) directly opposite the SUSPENSION BRIDGE, from there it is just around 800m to New Ranweli Spice Garden. A path on the right side of the road leads to the garden. The Tea Museum, Hantane, Kandy. The ancient Tea Factory of Hantana Estate is converted into a Museum dedicated to the history of Sri Lankan Tea. Run by the Sri Lanka Tea Board. Udawattakele Royal Forest Sanctuary, is a forest reserve located on a hill ridge in the middle of Kandy. It is 104 hectares (257 acres) large. It was a royal reserve and the tranquil pond near the entrance is said to have been a royal bathing pond. One can take a wonderful walk on well maintained tracks through dense jungle. The large circular walk will take about an hour. You are guaranteed to come across plenty of monkeys, which although curious are not dangerous, and possibly deer and wild boar. Wear long trousers after rain, and take some mosquito repellent or salt as there are lots of leeches about when it is wet. The entrance is above Trinity College and Kandy Municipality. The fee for foreigners is Rs. 570-. Because the forest is large and secluded it is not recommended for women to venture alone in the forest. In 2013 two young German women were molested by a group of drunk men in a remote part of the forest. There are a few Buddhist monasteries in the forest, but these are private areas that should not be entered. Temples situated around Kandy are some other popular tourist attractions. The most famous temples are: Gadaladeniya (LKR300, serviced by many buses), Lankathilaka Viharaya (LKR300), Embekke Devalaya (LKR300; serviced by bus 644, LKR35, 1 hour), Dodanwala Devalaya, Degaldoruwa, Hindagala Viharaya, Madawala Viharaya and Galmaduwa Viharaya. Visit Athur's seat for a panoramic view of the Kandy city. Commonwealth War Cemetery is located at Deveni (2nd) Rajasinghe mawatha down by the Mahaweli riverside. Formerly known as Pitakande Military Cemetery, it is one of the most beautifully landscaped and maintained war cemeteries in the world. There is one Commonwealth burial of the World War I and a further 196 Commonwealth burials of the World War II commemorated in the cemetery. In addition there are four Foreign National and two non world war burials. The range of nationalities laid to rest comes from the records of the War cemetery, and include 107 Britons, 35 East Africans, 26 Sri Lankans, 23 Indians, six Canadians, three Italians and one Frenchman. You can take any bus that goes towards the Botanical garden, get off at the Gatambe ground, and this place is a short walk away. Along the way, the Mahaweli river will be to your left, and it is quite beautiful in the mornings. The Kandy district has large number of known treks. Within the Kandy city the short walk of Asgiri Maha Viharaya via Bahirawakande hill is an interesting. Udawattakelle forest reserve in within the city limit, gives valuable walking in nature. The secret Walkers Forest upper Hantane trek is on special permission from the Municipal Council of Kandy. The famous Western Shrines of Kandy Gadaladeniya, Lankathilake temples and Embakke shrine are connected by a very scenic footpath. Other part of the west of Kandy, a part of Portuguese War Route, via Ihalakotte railway station to Dodanwala Devale shrine is passing forest reserves, Alagalle Mountain, tea estates and kandyan traditional villages. East of Kandy city the temples Gangaramaya, Galmaduwa, Degaldoruwa temple are well known for paintings, sculptures and architectural techniques.Knuckles mountain range and its forest trails are the most suitable for trekking in Sri Lanka. It has many nature trails cleared trough the forest by forest department with campsites. For example Mini world’s end trails in the west and east, Pitawala pathena trail, Ash cave trail, Nitre cave trail, Knuckles summit trail are very exciting. Also there are interconnected footpaths of cardamom planters, toddy tappers, tea plantation workers, farmers and villages. Traditional villages of the Knuckles foothills with so mach of treks and short walks such as Last King of Kandy, Sri Wikrama Rajasinhe’s (1798-1815) hideout place, Rathna water fall trek, Sitakotuwa limestone cave and waterfall trek, etc.South of Kandy the longest rice field scenery of the island, Lamasuriyagama the rice field was belonging to royal court of Kandy a very spectacular trek. It is undisturbed from electricity wires for photographs and with terrace rice fields by a Loggaloya river with watch huts of farmers. Loggaloya riverine forest trail to Victoria – Randenigala – Rantambe sanctuary is also a very interesting trekking. Perahera is the most famous festival in Kandy usually in August. It's a pageant where many elephants participate. You can buy expensive seats or can see it with the crowd. Buy a seat from the Queens hotel. This will be around $40. Buy the tickets from the officials or otherwise through middlemen you will be paying exorbitant prizes. Kandyan dancing you can see this traditional form of dancing in the "Kandyan Cultural Center" near the Kandy lake. But prepare to be harassed by the touts. Just try your way around them. If a tout brings you into place, he will later get a 50% commission from the Center, which you will have paid for. Buddhist Publication Society this is located on the lake to the east of the Temple of the Tooth. There is a large bookshop where you can buy books about Buddhism and get information about places to meditate. Nilambe meditation center, . This is a Buddhist meditation retreat centre which offers experiences of a mindful Buddhist lifestyle. You can engage in daily activities which involves yoga classes, meditation and discussions. Take a "Galaha" bus passing Peradeniya and get down from Nilambe "office junction". Costs are about LKR1,000 per day including lunch. In the main tourist season the place is heavily booked and is best to contact beforehand if one wants to stay. If there's a cricket match on, spend a day at the Asgiriya Stadium, possibly the world's prettiest test match venue, and certainly the only one that for most of the year is simply a school sports ground (Trinity College). Laksala is the somewhat overpriced state owned handicraft shop, with many of the items sold here easily found for much cheaper prices in other stores throughout the country. Laksala is located by the lake. Kandy City Centre opened up in January 29, 2009. It is an ultra modern shopping complex with space for over 400 shops. By the time of its opening it is the country's most modern and biggest shopping complex. Devon Restaurant is famous for quality snacks. Captain's table is at Upstairs of Devons. Good Sri Lankan and South Indian food. Avanhala, is just in front of the Kandy lake. Good food and best scenery. SRIRAM Indian Restaurant located in the Colombo Street offers nice south Indian food. Dinemore , just opposite to the Anniewatta tunnel. On the top of Nihal's Super. Quality Mid-Eastern and South-Indian food for affordable prices. Lyons restaurant located in front of the Hindu Kovil. Serves quality food, both Western and Eastern. There are two popular bars on the main street (Dalada Vidaya), The Pub and The Pub Royale. The former serves quite good (but pricey, perhaps LKR700) meals, has a large screen for sports inside and a 1st floor outside verandah. There are a number of cheap bars (LKR100 or less for a 650ml bottle of beer) scattered throughout the side streets near the town center. They can be rather seedy and the kind of place where unaccompanied women could be made to feel very uncomfortable. Victory Hotel, 79 Colombo Road This bar is a great way to see real Sri Lankans and what they do, downstairs is full of locals knocking back Arrack the atmosphere may be less than salubrious, in fact it gives the Sidney Hotel, Galle a run for its money, but the people are friendly. Upstairs is slightly less dingy as it serves food, Arrack starts at LKR700, beer LKR195 and a cigarette from a waiter LKR30l. There are lots of cheapish guest houses to the south and east of the lake, about one kilometer from the town center, and generally clean and friendly. Saranankara Road to the South of the lake has a concentration of budget and mid range guesthouses with many different types of rooms near the top of the hill (best to catch a tuk tuk to the top of Saranankara road, instead of walking uphill if you have luggage, it's a steep climb, price for a tuk tuk should be maximum 150 from the main street in the city center or 200 LKR from the train station). As of December, 2015 room prices at Saranakara are from 1000 LKR for a hole with shared bathroom, 1500-2500 for a nice fan room, and 2500+ for AC room. The guesthouses vary widely in quality, some owners are very aggressive in recruiting guests, be firm if you don't like the room they offer you. With Kandy's climate AC is not really necessary and nights can even be cool, so many guest houses don't even have AC, don't be afraid to get a fan room. There's a laundry shop at the beginning of De Soyza Lane, near the Clocktower, that charges 200LKR per kilo and serves in the same day. Also, there are some other laundries with name "Budget wash" that charge only LKR80 per kilo, with a minimum of 3kg. One branch is near the Dinemore/Nihas' Super. Kandy is a very safe place and more relaxed than the east and north of Sri Lanka. Women however should be cautious (especially at night) and kindly deny help when approached by someone. When seeking advice, address your question to local women, which generally are happy to help. Tuk-tuk driver - Beware of the usual suspects that offer you to take you to the "best thing in town", which is "too far away to walk" or an alternative to where you want to go because "today yours is closed". Generally, all such advice is wrong and must be consider critically. Most things in town can be reached by foot. If you want to get out, the local buses are a good option - just go to the bus station and ask at the counter or one of the bus guys. Touts - There are many guys strolling around and offering their help to tourist. Often they approach you by saying "You remember me?" or by telling you they work at the guest house or hotel you stay in. Of course the usual "Which country?" is also very common. This is of course all bushwa and just a conversion starter to trick you into buying something or taking an overpriced tour with them. Touts that bring you to shops or hotels, Kandyan dancing, etc. will get a large commission from the place they bring you to, which will be included in your bill. There is a lot of heavy black soot in the air and in the compartment on both buses and trains, even slightly noticeable over long distances in AC 1st class cars. Any significant distance will result in soot in your pores, nasal passages, mixed with sweat and sticking to your clothing. Train is the best option if you are heading further into the mountains towards Hatton (Adam's Peak), Nanu Oya (Train Station for Nuwara Eliya), Haputale (Lipton's Seat, Horton Plains National Park), Ella (Ella Rock) or Badulla. There is an observation saloon (1st class) in some trains. 3rd and 2nd class unreserved tend to be crowded but tickets can be bought right before the train departs. Best check the train times and situation one day before departure - you can always opt for the bus. If there are no reserved tickets left, ask if they have tickets from Peradeniya train station which is 6 km from Kandy and can be easily reached by bus, tuk tuk or taxi. The Kandy train station is located south west of the town next to the Good Shed Bus Station. The trip to Haputale is about LKR200 for 2nd class, reservation however will set you back another LKR600. Note that the train line between Kandy and Nuwara Eliya (Nanu Oya) is completely booked out for all of December 2015 as of December 19, 2015. Second and third class unreserved seats are still available but can only be purchased on the day of travel and the trains were really crowded with locals and tourists. The trains are full even as they arrive to Kandy station as locals seem to be getting on somewhere else, so no seats were left even before the train arrived in Kandy. This page was last edited on 4 April 2019, at 09:28.